Time to empty the notebook that is filled with college men’s volleyball news and notes. Check out some of the more interesting news tidbits and other notes involving college men’s volleyball. Outside attacker Austin Matautia will transfer from Hawai’i to UCLA for his junior season in 2019, according to a report from KHON2. Matautia ended last season in the Big West’s top 20 with a 1.91 kills per game average on a .349 attack percentage and was fifth in the conference averaging 0.36 aces per game. Matautia told the Honolulu television station that he decided to transfer because he wanted to go to a more uncomfortable setting after growing up in Hawaii. Purdue Fort Wayne middle attacker Tomas Gago had a combined 12 kills and two blocks for Chile in two matches at the FIVB Challenger Cup last week. The MIVA All-Freshman selection also started in Chile’s four-game loss to Cuba that eliminated the country from the international tournament. The University of Jamestown announced it would sponsor men’s volleyball beginning in 2020. Jamestown, a NAIA member, is a private school located in North Dakota and has an enrollment at about 1,000 students. This is the first college from North Dakota to add men’s volleyball. Former Long Beach State middle attacker Taylor Gregory was hired to be an assistant coach for the Seattle University women’s volleyball team. The two-time All-American after graduating from Long Beach State in 2016 played professional volleyball in Finland for two years. Gregory also spent last season as an assistant coach for Golden West College. Ohio State Assistant Director of Communication Kyle Kuhlman was named the AVCA Grant Burger Media Award inaugural recipient of the men’s volleyball sports information director category. Kuhlman, who Off the Block editors endorsed for this award, oversaw the Buckeyes’ social media platforms and was the media liaison for the MIVA championships. Stanford Assistant Communications Director Regina Verlengiere won the Division I sports information director category. Verlengiere serves as the media liaison for both the Stanford men’s and women’s volleyball teams. Ball State, George Mason, Long Beach State, King and Pepperdine also earned the Grant Burger Media Award sports information director conference honors. The Off the Block store unveiled the 2018 EIVA championship shirt and tank top. 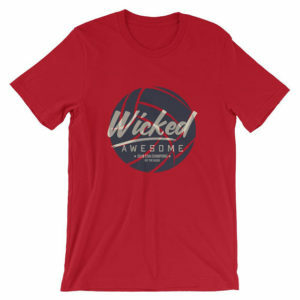 The shirt features the Boston phrase “Wick Awesome” to celebrate Harvard winning its first conference championship in program history. Proceeds from shirt sales fund Off the Block and helps the website provide better coverage of college men’s volleyball. To order your 2018 EIVA championship apparel, click here.